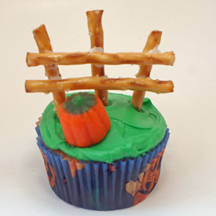 Run, run as fast and you can … and make cupcakes that look like a gingerbread man. Cute for Christmas! 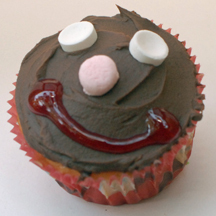 What You Need: 1 cupcake; chocolate frosting; 2 white Smarties candies; 1/2 pink mini marshmallow; red gel writing icing. Of course you can switch out the candies for whatever you have on hand. How to Make It: Frost cupcake. Add candies as shown for eyes and nose. Use gel to draw mouth, allowing extra gel to pool at either end to look like rosy cheeks. What could be simpler than popping a marshmallow Peep on a cupcake? 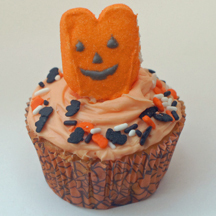 What You Need: 1 cupcake; orange frosting; Halloween sprinkles (I just used Pillsbury’s Halloween frosting and the sprinkles that came with it); orange jack ‘o lantern Peep. How to Make It: Frost cupcake, making a small mound of frosting in the center. Place Peep in center. 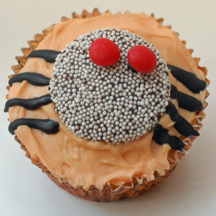 Sprinkle sprinkles around edge of cupcake. 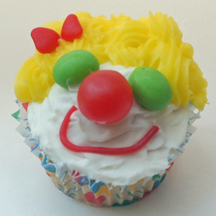 I used a few shortcuts to make these clown cupcakes quick and easy. I didn’t feel like mixing up icing, or even tinting frosting from a can, so I attached a star tip to Wilton icing in a tube and used that. Also, you could pipe a red mouth, but I just used licorice. What You Need: 1 cupcake; white frosting; yellow icing in a tube; metal or plastic star tip and coupler; cherry or sour red candy balls; heart-shaped red hots (cinnamon imperials); 2 lime Runts (or other candy); red licorice. How to Make It: Frost cupcake white. Use star tip and yellow icing with star tip to “draw” hair. Add 2 red hots with points facing inward for bows (You could also use red Runts; they are kind of heart-shaped). Place 2 lime Runts for eyes and a red cherry or sour ball for nose. Add strand of red licorice for mouth. Remember, you don’t have to have these exact candies–just use what you have on hand! 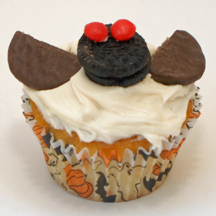 Make holiday guests happy with these happy elf cupcakes. Experiment with different colors and designs and let your creativity shine in your workshop-kitchen! 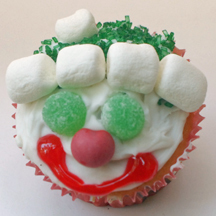 What You Need: 1 cupcake; white frosting; green sugar crystals; 2 green gumdrops; red candy for nose (we used Runts); mini marshmallows; red gel writing icing in tube. How to Make It: Frost cupcake. Sprinkle green sugar near top of cupcake for hat (It doesn’t have to be perfect, because the brim will be covered up with marshmallows). Add row of marshmallows to brim and near edge of cupcake for pompom. Add gumdrop eyes and candy nose. Use gel to draw red mouth, letting it “blob” up a bit on either end for cheeky appearance.